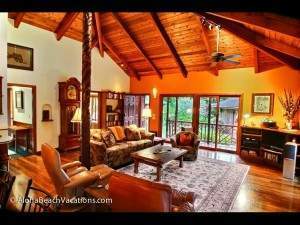 This 5 BR Estate is located on one of the most beautiful white sand beaches on Kauai. The beach is about 70 yards wide right in front of the Estate. Anahola Bay is perfect for playing in the ocean with a large sand bar & sandy bottom bay with waves great for swimming, boogie boarding & surfing. Go out 100-150 yards into the bay & you are about knee/waist deep. The 5,000+ sq. ft. well-designed estate has both beachfront living room & dining room areas with ocean views, hardwood floors & comfortable Hawaiian furnishings & accents. The Beachfront Estate is wonderful for large groups, family reunions, retreats, multiple families, etc. There are 5 bedroom suites with private bathrooms with 2 Kings & 3 Queens. There are 2 additional bedrooms with 4 twins & 2 daybeds that share a full bath & a shower.There is also a den with a sofa sleeper for even more sleeping for a large group. There are 6.5 baths total. This home is centrally located on Kauai to help you easily enjoy the adventures & beauty of the entire Garden Isle. 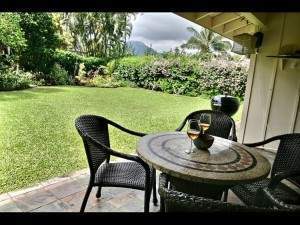 Conveniently located about 5 miles from Kapa’a with its great restaurants & shopping.